I got the Colorado last spring and my daughter and I have been out on it over a dozen times over the late spring and summer. They are very well built, easy to transport and can hold 500 Lbs. These are not the inflatable dingies we played with as kids or something you tow behind a boat a couple times before it's destroyed. The material is some very tough stuff and I have ran over a lot of logs, sharp rocks and even barnacles w/o any damage. They weigh about 35 Lbs and my 11 y/o daughter and I can easily carry it full of gear. I drive a Toyota 4Runner so all I have to do is deflate the two side walls and fold it in half to load it. Completely deflated it can fit in a bag the size of a large suitcase. The side walls inflate in less the five minutes with a foot pump. The floor is an I-beam construction and is very rigid when inflated. The seats are adjustable and give very good support. The canoe is very stable and handles wakes from boats great. I use kayak paddles on mine. I highly recommend the Colorado and it's one seat version the Rio. for light weight camping or day trips. I got mine for $349 with free shipping from Leisure pro sports. The promo video for it. Me out on Hogum Bay skirting the shore to get some wave action. That is a nice setup. Easy to transport! Does it require a boat license? I'm guessing not but uncle sam wants every penny they can squeeze out of us. Great inland alternative. I don't think I would feel comfortable on the ocean. I wonder how well it would work for fishing? It looks pretty thick skinned. I think around here "rowboats" are exempt from licensing..For a while they were ridiculous with people trying to silicone numbers on rubber rafts and float tubes but that didn't make a whole lot of sense. I think if it is fueled motor verses a non-combustion engine(electric)..you need numbers for ones that are connected to international waterways.Most lakes aren't connected but ones that are connected by navigable sloughs and rivers to Puget Sound.I haven't bothered licensing or using any boats for a large number of years..so I'm probably wrong.They maybe needed in national parks also..for fuel-combustion-power watercraft. Yes, really nice set up. 1st photo made it look small, second made it look right Nice to have your daughter interested in the things you like nice to have extra paddling power How does the color work out for you, does it get hot on sunny days being a dark color? HaHa, I thought you were going to do an intentional bump into that post in the water for a "funniest home video"
In WA state there are no licenses or permits required or requirements that boats over 12' have. The national parks allow electric and paddle craft w/o any permits. It works great for fishing. This was last summer on Alder Lake near Eatonville WA. I have taken it out on Puget Sound and had some 1' chop on the water and it did great. It flexes around and over waves so it's safe, even when the hit from the side. The canoe is very stable compared to rigids. All you need is a 3' wide patch of beach to launch it. I haven't noticed any heat from the material getting hot. The Sevylor inflatable line of canoes have been popular in Europe for a long time. They don't own as many SUV's as we do here and they can stuff these in their trunks or back seats. Initially I was going to get a rigid and found several nice used ones for half of what the Colorado cost. But then I would have had to install a roof top carrier and load and unload it by myself since my daughter just wouldn't be of much help. Then I started reading on the new generation of inflatable canoes like Sevylor and the Stearns Back country. It didn't take long to realize this was the way to go. It very much falls into the ultra light philosophy. How many air chambers does the canoe have? Any chance a hook barb could snag one? Would it still stay aflloat with one chamber down? It has four separate chambers plus one for each seat. And yes we are careful when fishing although I carry a quick patch kit that can be used on the material even if it's wet. I also carry the foot pump with me when I go out. Behind each seat is a mesh cargo bag that can be detached and used as a large fanny pack. It has three external water bottle holders also. Nice design features. Does it fold only one time end to end? zelph wrote: Nice design features. Does it fold only one time end to end? If I deflate the two sides then it can fold in half. I have not tried folding it in thirds yet. Even if you have to completely deflate it it only takes 10 minutes to inflate. And that is with a foot pump. 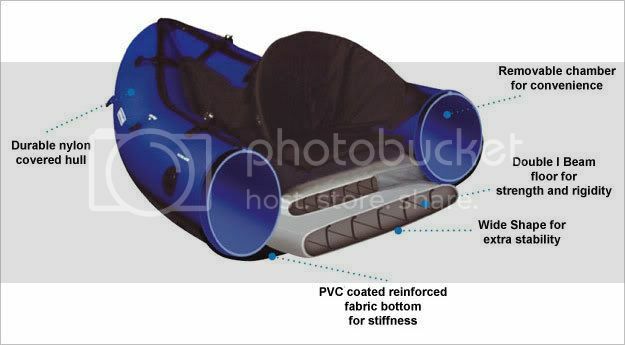 Next summer when I take it on a camping trip I will probably sleep in it so it has a dual function.